Protector Compatible With Predisposed Dainese Jackets & Jeans. General Features. Perforated Structure. Excellent condition only used twice as too tight under leathers. Dainese Thorax Pro Chest Armour. Liner in double jersey. Shaped polypropylene front plate. Side-plates to protect the ribs. Chest protector certified to Pr-EN1621.3 lev.1. Perforated structure. Functional pattern. Longtiduinal bending. Performance Shock. Moto Central: Dainese Manis D1 G2 Back Protector. Longitudinal Stretch. Longitudinal Bending. Inner Core In Perforated Crash Absorb Shock Absorbing Material. Back Protector With 4 Degrees Of Freedom Torsion. 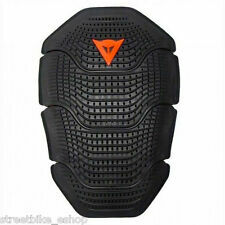 Dainese DTEC Back Protector. Protector measures 44cms in length Condition is Used. Dispatched with Royal Mail 1st Class. Dainese HYBRID SHIRT E1 motorcycle protection. Perforated shirt with rigid protectors on the shoulders and elbows. Hersey Holl and perforated Sanitized fabric for the maximum aereation. A final layer of comfort material ensures precise coupling with the surface anatomy of the back. Back protector with 4 degrees of freedom Distance between waist and shoulder 40 - 45cm. Localised comfort padding. Moto Central: Dainese Pro Armor G2 Back Protector. Anatomical Shape. Perforated Structure. Back Protector Certified To Ce - Cat. Ii - En 1621.2/2014 Lev. Funcional Pattern. Performance Shock. Vest provided with integrated MANIS back protector. MANIS plates made of polypropylene and Crash Absorb® absorption material. The vest is made of comfortable elasticated Jersey Holl fabric. Back protector certified to standard EN 1621.2 - Level 2. Moto Central: Dainese Pro Armor G1 Back Protector. Anatomical Shape. Perforated Structure. Back Protector Certified To Ce - Cat. Ii - En 1621.2/2014 Lev. Funcional Pattern. Performance Shock. Dainese Armoform Elbow Guards - SMA LL. XXL Dainese Manis body armour and spine guard set. Brand new without tags. Immediate payment via PayPal please. Free delivery. Please see my positive feedback from other buyers. Thanks for looking. Moto Central: Dainese Shoulder Protector Kit. Easy-fit light aluminum shoulder plates in 3 contrasting colorways. Everything needed is included in this kit. Colour: Anthracite. Series: Soft Pro Shape Shorts - Short Protector Soft 04. XL = Waist 100cm. Ordered wrong size never used . Can't find what you're looking for?. Sizing Guide. As seen in the photo, there is one area to note. This does not affect the integrity of the protective material. Centre zip closure. Chest protection. Excellent condition. · Made in Italy. Moto Central: Dainese Wave D1 G2 Back Protector. Back Protector Compatible With Predisposed Dainese Jackets. Lumbar Joint. Back Protector Certified To CE - Cat. II - EN 1621.2/2014 Lev. External Polypropylene Plates With Perforated And Waved Structure. Moto Central: Dainese Manis D1 G1 Back Protector. Longitudinal Stretch. Longitudinal Bending. Inner Core In Perforated Crash Absorb Shock Absorbing Material. Back Protector With 4 Degrees Of Freedom Torsion.